It’s easy to get caught up in the excitement of the season – and not realize the damage you’ve done until you get your credit card statement in January. This year, plan ahead. 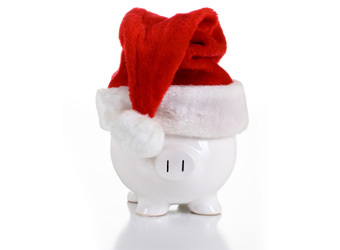 Follow these tips to stay within your holiday budget. Looking through a photo album recently, I realized that I had worn the same black dress every holiday season for the past four years. So at a mom’s night out, I asked if anyone wanted to come over for a night of dress swapping – and couldn’t believe when every single woman eagerly embraced the idea. Not only did I get to borrow a beautifully festive red dress for an upcoming party, but I felt great lending my beloved black dress so it could grace someone else’s photo album for a change. Consider a budget-friendly secret Santa. Everyone’s been feeling the pinch lately, so why not offer everyone a break? My brother-in-law suggested we do a not-so-Secret Santa a few years back, and it’s made buying (and spending) much more enjoyable. Instead of hastily buying dozens of presents, we all thoughtfully choose just one. To make sure everyone’s on the same page, pick a dollar amount – we chose $50 – for everyone to stick to. Get creative with low-cost gifts. You can give great gifts even if you’re on a strict budget. Consider homemade presents– one of my favorite gifts last year was some lavender scented soap a friend made. My friend Maggie and her husband whipped up a batch of gourmet mixed nuts and gave them to friends in a decorative bag. Or, if you use a credit card that offers reward points, see if you can use them toward gifts. And don’t be afraid to gift non-material items. If you’re handy with a computer or great with kids, offer to build a friend a web site or baby-sit their kids. Make parties a real group affair. Throwing a holiday party can quickly become costly. But there’s no rule that entertaining has to mean lavish dinner parties. Keep it casual by inviting friends to a potluck. One mom I know likes to invite friends over for a “bring your favorite dish,” party, while another prefers to make the main course and ask her guests to bring the sides, appetizers, and dessert. Evite.com is a great way for guests to RSVP with what they’re bringing, so others know what’s still up for grabs. Not only will you save money, but less work means more time to relax and enjoy the party yourself! There are also lots of ways to give without spending money. There are many clothing and food drives around the holidays or you can volunteer at a shelter and other places. It feels great to help others!